Comin’ your way: Another episode of “Easy Ed’s Variety Hour”—two hours of Rockabilly, Hillbilly, R&B, and Rock and Roll! I’ve got lots of great stuff lined up to play for you, but do send in your requests and I’ll do my best to play them! Archived shows are available at www.easy-ed.net and also through iTunes (as a podcast). March 3: I will be the guest DJ at River Gods in Cambridge for Primitive Sounds night. Thanks to Jason Beek, P.J. Eastman, and the folks at River Gods for the invitation. Please stop by! The music starts at 9:00 PM. Here's what I played tonight. If you tuned in, thanks for listening. If you missed the show and would like to hear it, the archive MP3 will be available for download from http://www.easy-ed.net/ later this weekend. Easy Ed’s Variety Hour will take to the airwaves and ‘netwaves once again this Friday with two commercial-free hours of Rockabilly, Hillbilly, and 50s/early 60s R&B and Rock ‘n’ Roll. Please note our new show time on the WMFO calendar: 7:00 to 9:00 PM. 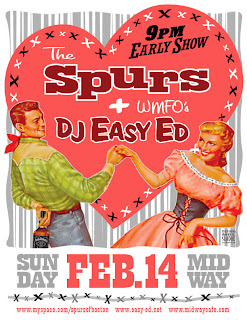 This is an early-start show: I’ll start spinning at 8:45 and The Spurs will take the stage shortly thereafter. PS. Below is a list of what I played on the 1/29/2010 show. An archive MP3 of this show can be found at www.easy-ed.net.